Nuxe is a staple in the bathroom of many French women. Its Huile Prodigieuse has long been the go-to for adding shimmer to a Mediterranean tan and I’m very excited that they’ve recently launched a fragrance version. In general, I’m a big fan. I was also taken in by the big box which actually holds a rather small 40ml tube! The cream, sorry, ’emulsion’, smells amazingly tangy (so avoid if you’re not a fan of citrus scents). Designed for normal to combination skin it strikes just the right balance of lightweight versus hydration, which some natural creams definitely struggle with. Great if you don’t like greasy creams or for use in the summer (especially under a natural UV cream). I like my face creams super rich so I will probably go for their dry skin version next time. But my skin feels very soft. I didn’t use it religiously day and night as suggested, but I would highly rate this as a natural face cream. And my face smells delicious! Unfortunately you won’t find this on Nuxe’s UK website yet, but it is available on the French pharmacy website cocooncenter.co.uk (along with Weleda’s cold cream, which I highly recommended a while back). Delivery is €9.90 which is about £8 so might be worth it if you felt like stocking up. 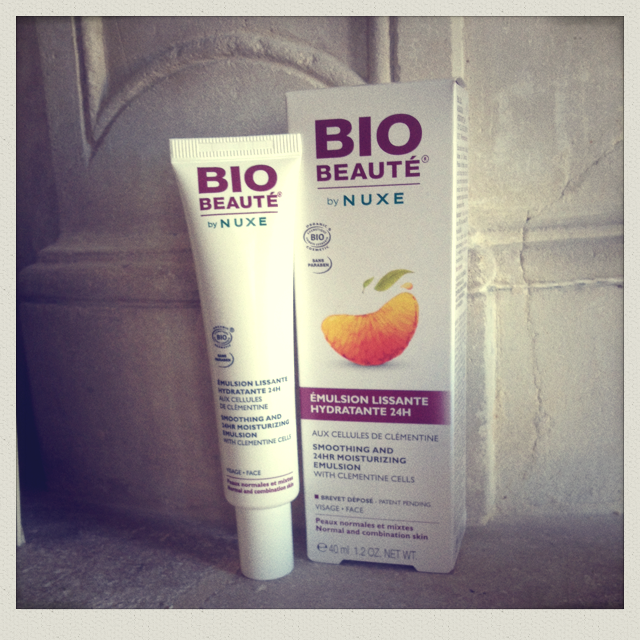 I’ve got a feeling the Nuxe Bio Beauté brand might have some real pearls amongst its products and I’ll definitely be picking up their emulsion for dry skin on my next trip (or asking my mother in law to bring some over!). I’ll chase them to see if there are any plans to introduce this to the UK market and update you here. Natural credentials: Clementine cells and poppy petals to moisturise along with pear seeds to smooth lines. 98.8% of the total ingredients are from natural origin and 72.4% are organic.